Is there a way to determine if you have packages in your package.json file that are no longer needed? For instance, when trying out a package and later commenting or deleting code, but forgetting to uninstall it, I end up with a couple packages that could be deleted. What would be an efficient way to determine if a package could safely be deleted? You can use an npm module called depcheck. The good thing about this approach is that you don't have to remember the find or grep command. It is quite powerful and actively developed. One of it's features it checking for unused dependencies - for this part it uses the depcheck module mentioned in the other answer. The downside is that it's not fully automatic, i.e. it doesn't extract package names from package.json and check them. You need to do this for each package yourself. For parsing package.json we can use the software jq. The below shell script requires a directory name where to start. echo -e "USED ($RES)\t $PACKAGE"
First it creates two temporary files where we can cache package names and files. It starts with the find command. The first and second line make it ignore the node_modules and build folders (or whatever you want). The third line contains allowed extensions, you can add more here e.g. JSX or JSON files. A function will read dependendy types. After that, sed extracts the parts between the quotes, the package name. -n and .../p tells it to print the matching parts and nothing else from jq's JSON output. Then we read this list of package names into a while loop. RES is the number of occurrences of the package name in quotes. Right now it's import/require ... 'package'/"package". It does the job for most cases. Then we simply count the number of result lines then print the result. You have to grep manually for only ^USED and UNUSED files. It's slow for large projects - shell scripts often don't scale well. But hopefully you won't be running this many times. user11403389 is a new contributor to this site. Take care in asking for clarification, commenting, and answering. Check out our Code of Conduct. Not the answer you're looking for? 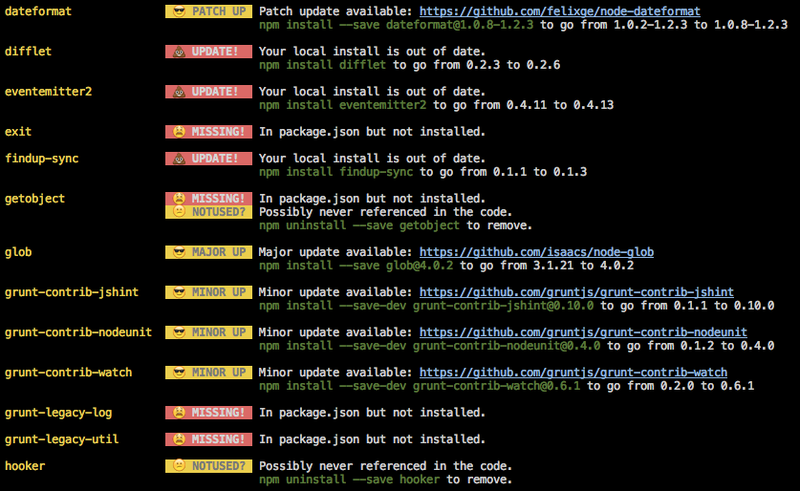 Browse other questions tagged node.js dependencies npm or ask your own question. How to list unused node modules/dependencies from your React Project? NodeJs: Is there a way to figure out what modules are not being used by my program?